Just look at the Texas drought — California could be waiting years to recover. Parts of California got more than five inches of rain over the last 24 hours, as a stream of moist, tropical air soaks the desperately dry state. 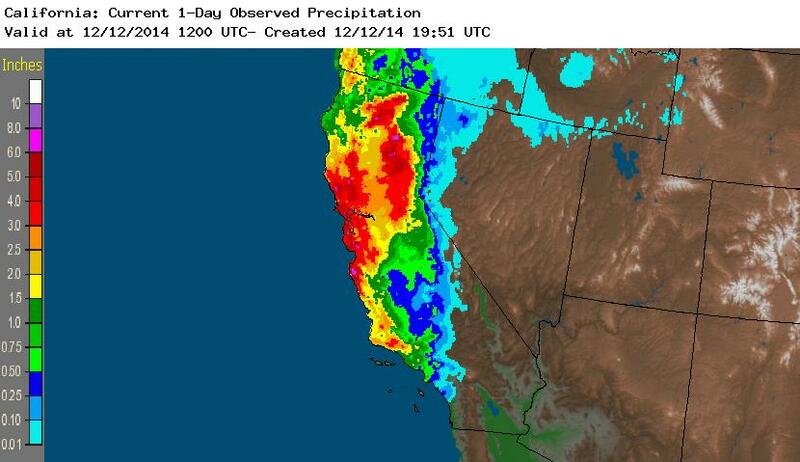 Many more such storms will be needed to break the state’s three-year drought. Click image to enlarge. Instruments at San Francisco International Airport recorded more rain over the first six days of December than in the entire 365 days of 2013, the driest year on record in California. Just 8.58 centimeters (3.38 inches) filled the airport rain gauge in 2013, compared to 9.65 centimeters (3.80 inches) already this month. Weather forecasters expect more rain to come — up to 12.7 centimeters (five inches) in parts of the Bay Area this week — as a stream of moist, tropical air soaks a state that is desperate for water. Even the mountains will benefit from the early-season storm, with parts of the northern Sierra Nevada expecting nearly a meter (three feet) of snow. Yes, it is raining and snowing in California. But a few weeks of wet weather will not erase the steep moisture deficits that have been accumulating since 2012, according to hydrology experts. Rather, several consecutive years — not weeks — of above-average precipitation will be necessary to rebalance the state’s water resources. In other words, California has a deep hole to climb out of. Northern California’s moisture deficit is equivalent to a year’s worth of rainfall, according to Michael Dettinger, a U.S. Geological Survey hydrologist. The deficit increases going south along the Sierra Nevada, which is called the state’s ‘water tower’ because of its capacity to hold water in deep banks of snow. “Even if we get average precipitation, we’ll still be a year behind,” Dettinger told Circle of Blue. Roger Bales, a hydrologist at the University of California, Merced, agreed. The reason that the drought will not be busted by one week of storms rests in the intricate relationship between water, soil, vegetation, and heat – precipitation is not even half the story. Drought has multiple phases. Technical experts make a distinction between meteorological drought (what falls from the sky) and hydrological drought (what moves through rivers, lakes, and reservoirs). Often there is a lag between the two. Trees use water to grow tall and leafy. Soils – turned to dust in dry years – act as a sponge, holding water in their loamy pores and trapping it before it can reach a river. The sun, a third force, evaporates a portion of the rain and snow and returns it to the atmosphere. The dynamic was evident in 2014, most likely the state’s hottest year on record. Warm temperatures made the drought even worse than the hydrology would have indicated. Trees, soils, and sun – each force will prevent water from reaching California’s reservoirs, which are at historically low levels. Even the Sierra Nevada snowpack will be subjected to these natural taxes during the spring melt. “Most of the state has a long way to go in filling soil moisture before precipitation can generate significant runoff,” Dettinger said. An ideal rain would be slow and soaking, allowing the soils to saturate several feet below ground. Violent cloudbursts, happening across the state this week, may only dampen the first few inches. While that produces a quick flush of water into streams — and, in turn, flash flooding — the sun will dry out the top layers just as quickly, Dettinger explained. “Then you’re back in the same boat,” he said. The rain this week has provided a small but welcomed boost to reservoirs so far. Lake Shasta, the state’s largest reservoir and the source of water for federal canals, is 47 percent of its historical average, up 7 percentage points in a week. A very basic analogy can be drawn with Texas, which experienced its hottest, driest year ever in 2011. Satellite measurements revealed that nearly 80 percent of the water that was lost to the drought had evaporated from soils. Today, even as the rains have returned, reservoir storage still has not recovered. “We’ve had near-normal precipitation years since 2011, but nothing has gotten the reservoirs over the hump to where they are receiving much runoff,” John Nielsen-Gammon, the state climatologist, said in an interview with Circle of Blue. The reservoirs on the Colorado River in Texas, for instance, have hovered just above record low levels for nearly three years. In both California and Texas, the end of drought should not signal an end to vigilance, argued Andrew Dessler, a climate scientist at Texas A & M University. Climate change and a warming planet ensure that water resources will be an enduring challenge. Between the spring of 2013 and the spring of 2014, groundwater tables plummeted more than 15 meters (50 feet) in the Central Valley and coastal Southern California as farmers and landowners tap aquifers to survive a horrendous three-year drought. Click image to enlarge. Infographic by Kaye LaFond, a Circle of Blue reporter. Reach her at kmlafond@mtu.edu. We’re having excellent snowfall in the Sierra Nevada Mountains, with 10-14 inch increases on most snotels over the past two days. The storm largely went east of Las Vegas, directly dumping into Lake Mead. Very good news. Hopefully every turned off their water drippers for this week, and the Irrigation Districts cut back their orders. Two feet dumped in Utah, within the LCR basin. Very nice storm system. and it seems to be stalling. Very good news. It’s raining on July 19, 2015. Does anyone know what that means for rain later?